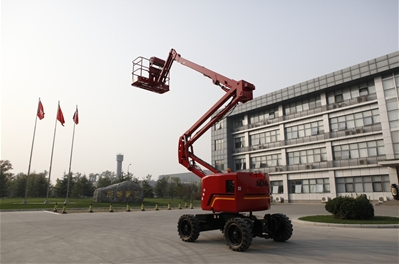 GTQZ16 self propelled articulating boom lift is a new product designed by JCHI. Perkins in-line type four cylinder water cooled engine is adopted as the power. It is 4 wheel drive and brake with 45% gradeability. The boom is composed of two groups parallel-four-bar-linkage with compact stowed volume and large raising stroke. Concise boom mechanism structure to ensure larger platform working scope. It is especially applicable to aerial work in exhibition arrangement and also in limited space. In addition, it is suitable for continuous aerial work at airport terminals, stations, docks, shopping mall, stadiums and other plants.